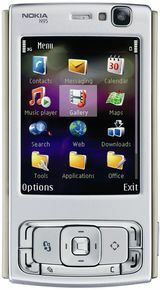 Nokia N95 is currently not available in any stores. Watch your favourite video songs and movies in video player. It supports MPEG4, H.263, H.264, 3GPP, RealVideo 8, RealVideo 9, RealVideo 10 file types. Listen to your favourite songs in music player. It supports MP3, AAC, AAC+, eAAC+, WMA etc. file types. this is the first smart mob in market in that year.nice phone with natural 5 mp camera with flash.net speed high process.nice sound quality.